Bob Geldof has joined forces with pressure group Transparency International (TI) to better ensure global aid is not lost to corruption. They will focus on the $50bn (£29bn) of additional aid to developing nations pledged last year by the Group of Eight (G8) most industrialised nations. "It will not be possible to beat poverty without fighting corruption," said Mr Geldof. Mr Geldof wants TI founder Peter Eigen to head a group studying aid delivery. The Live Aid founder said he would urge UK prime minister Tony Blair to appoint Mr Eigen to lead the independent monitoring committee on aid delivery proposed by Mr Blair's Commission on Africa Report. Mr Geldof, along with fellow anti-poverty campaigner and pop star Bono, says he wants Mr Eigen to head a committee of six or seven high-profile members. The call comes at a time of growing interest and concern about the effects of corruption on aid and development. In several countries, worries about the transparency of oil and energy income have emerged. In Kenya, meanwhile, several government ministers have resigned following allegations by a former senior member of Transparency International of widespread corruption. The allegations have helped trigger a freezing of some aid to Kenya. Mr Eigen said Tuesday's coming together of TI and Mr Geldof would have a real impact. "Today we have started a dialogue between a champion of the global fight against poverty and the worldwide organisation at the vanguard of the anti-corruption movement," he said. "This cooperation has the potential to save millions of lives and improve the quality of life for millions more." 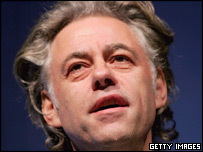 Mr Geldof said the proposed monitoring committee must "have an understanding of corruption and how it works". He added that structures need to be put in place to ensure that the G8's promised increase in aid got through to those who needed it. Headquartered in Berlin, Transparency International is an independent global anti-corruption pressure group.